Young readers will definitely catch the bug when they see this enticing, fact-filled invitation to explore the world of insects. (Ages 5-8) A Junior Library Guild Selection Right now, all around us, thousands of insects are doing strange and wonderful things: wasps are building nests, ants are collecting food, and dragonflies are readying for the hunt. But it's not always easy to catch sight of these six-legged creatures: you have to know where to look. Guided by this book, readers will happily become insect detectives and find out just what those bugs are up to. Gently encourages young readers to explore their natural surroundings and observe some of the more commonly found insects in it. 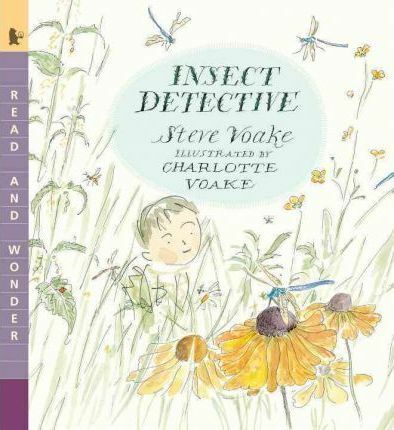 --School Library Journal (starred review) A charming and informative introduction to insects. --Library Media Connection Young readers will definitely catch the bug when they see this enticing, fact-filled invitation to explore the world of insects. --Etc. for Her Provides gentle encouragement to young naturalists to be curious and watchful. --Bloomsbury Review Will surely go down as one of the best picture books of 2010....An expertly crafted, funny, engaging title that should be a part of every collection. Steve Voake is the author of the Daisy Dawson series and several novels for young adults. He lives in Somerset, England. Charlotte Voake is Steve's cousin and the author-illustrator of many award-winning picture books, including HELLO TWINS. She is also the illustrator of Vivian French's CATERPILLAR, CATERPILLAR. She lives in Surrey, England.